Modern Warfair is a lovely young horse that we purchased in the spring, having finished second on his sole start in an Irish point. 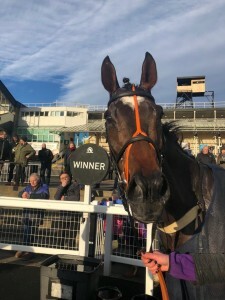 Having run two lovely races in novice company late last year, he got off the mark at the third time of asking with a last-gasp win at Doncaster yesterday under a fine ride from Alan Johns. Settled in mid-division, he travelled and jumped well through the first half of the race, but was outpaced when the tempo lifted and he looked in trouble when entering the straight with just one behind him. However, he stayed on resolutely from the second-last, responding to Alan’s urgings to reel in the eventual runner-up in the shadows of the post. I’m sure he will appreciate a stiffer test of stamina and certainly some softer ground. 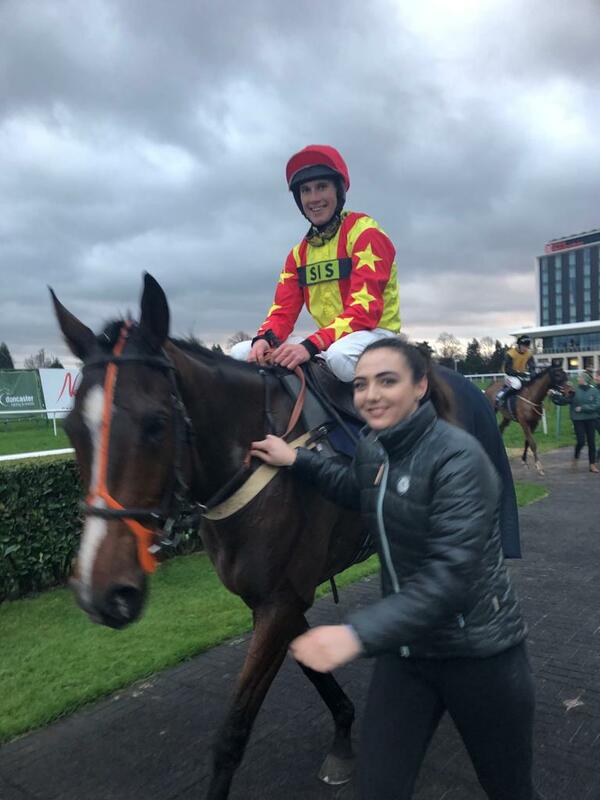 Just a five year old and out of a half-sister to a Midlands National runner-up, he is a really exciting prospect to go chasing in the future and I am delighted for his owners Brian Ead and Martin Moore, who are wonderful supporters of ours. Please see below a round up of the past week at Pant Wilkin Stables! 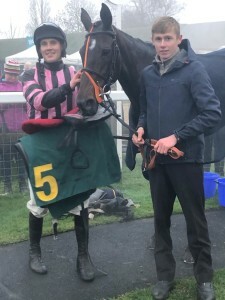 A ready winner over hurdles at Ffos Las last week, Briac looked likely to take all the beating switched to fences off the same mark at Sedgefield yesterday and so it proved, as he won impressively on just his second outing over the larger obstacles under a well-judged ride from Alan Johns. Held up, he travelled very well and, making his ground before the home bend, he was soon in front and kept on strongly for a wide-margin success. The handicapper will now have his say, but he looks to be improving and hopefully he can make a very bold bid for the hat-trick next time, which could come in the handicap hurdle back over two miles and Sandown Park in June, a race he won last year. Congratulations to his owner Olly Harris! A good second on his chasing debut at Chepstow in October, Debece made his second start over the larger obstacles a winning one at Newcastle yesterday, jumping well throughout under Alan Johns to take the novices’ chase in very good style. The son of Kayf Tara hasn’t had much racing in the past 18 months, but his close third in the Grade 1 Sefton Novices’ Hurdle at Aintree in April 2017 was a clear indication of what he is capable of and I have always thought he would make up into a better chaser, as he has all the attributes to excel over fences. 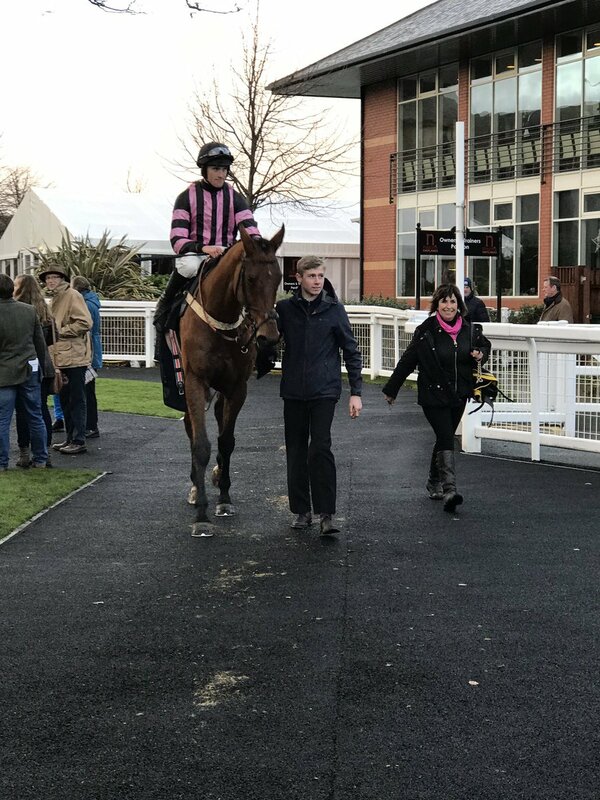 In many ways it was a relief to get yesterday out of the way and, all being well, we will now look to give him one more run before a tilt at the Festival in March. I am delighted for his owner Robert Kirkland, who is a wonderful supporter of ours. Briac showed notable improvement for a step up in trip at Ffos Las yesterday, winning impressively on his third start since joining us…and in the race we sponsored! 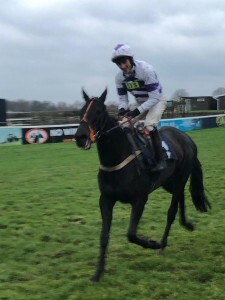 Held up in the early stages, he travelled noticeably well throughout and, though I was worried about the longer trip on what was very soft ground, he certainly appeared to enjoy the extra emphasis on stamina, keeping on strongly to score by nine lengths in the hands of Alan Johns. We’ll have to see what the handicapper does to his mark, but in the meantime we will look to give him a couple of entries over fences next week, as he could run without a penalty and hopefully he can follow up before he is re-assessed. Congratulations to his owner Olly Harris! A shade keen when sixth on his rules debut in a good Ascot bumper in November, De Forgotten One made his second start for the yard a winning one at Doncaster yesterday, making all the running to win the 2m5f maiden hurdle under a well-judged front-running ride by Alan Johns. 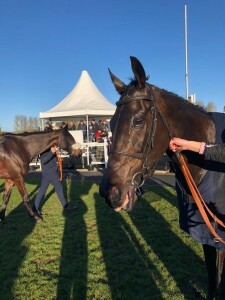 Sent straight into the lead, De Forgotten One jumped well throughout and, given a breather before the home straight, he quickly had the field in trouble when quickening up the straight and kept on strongly to score in very good style. 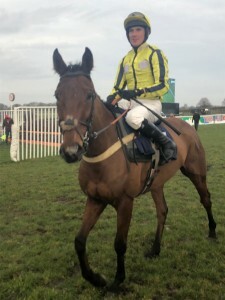 The five year old ex-Irish pointer, winner of his only start in points at four, looks a lovely prospect for fences down the line, but that’s for next season and, in the meantime, I hope he can win a nice pot over hurdles this term for owner David Fox. We’ll look for a similar novice contest under a penalty next time, before hopefully stepping up in grade. Charlie Price off the mark! 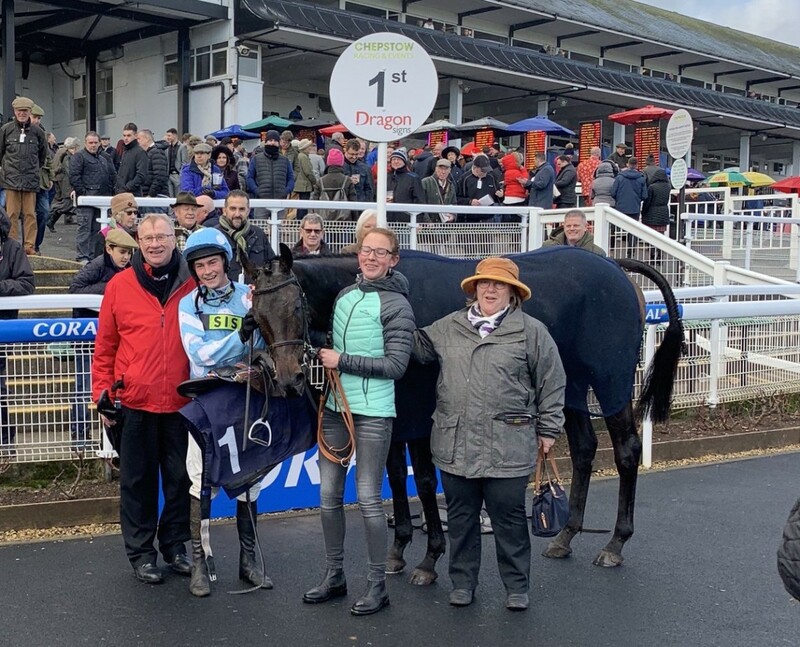 Having just his second ride since turning conditional, Charlie Price enjoyed a day he won’t forget at Chepstow on Saturday when winning on Trixster for the Pant Wilkin Partnership! 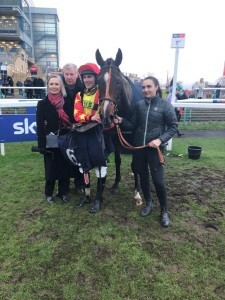 Having looked the likely winner when coming down at the last at the course in January, Trixster got off the mark over hurdles at Warwick in October and finished runner-up on his latest outing at Southwell. Back on heavy ground for the first time this season, he travelled noticeably well throughout the contest and, but just looked a little inexperienced when hitting the front, and required plenty of assistance from Charlie to hold off the persistent challenge of the eventual runner-up. 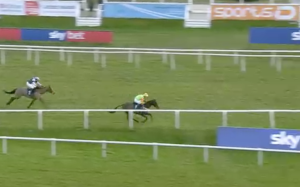 He is a very bright prospect and I can’t wait to send him chasing next term, but in the meantime we’ll look for another novice event (he escapes a penalty for this win, as it came in a conditional jockeys’ contest) before stepping up to handicap company. Congratulations to Charlie and the Pant Wilkin Partnership! Midnight Queen has been in really good form this season and the progressive eight year old added a hurdles success at Fakenham yesterday to her chase win at Newton Abbot in August. Sporting a first-time visor, she was sent straight into the lead by Alan Johns and, jumping proficiently, she had a sizeable advantage for the majority of the contest, briefly coming back to the field on the final circuit before kicking clear again from three out, eventually coming home a clear winner. She stays very well and does seem pretty versatile as regards ground, so hopefully there is another race in her in the coming weeks. Congratulations to her owners Brian and Wayne Jones! 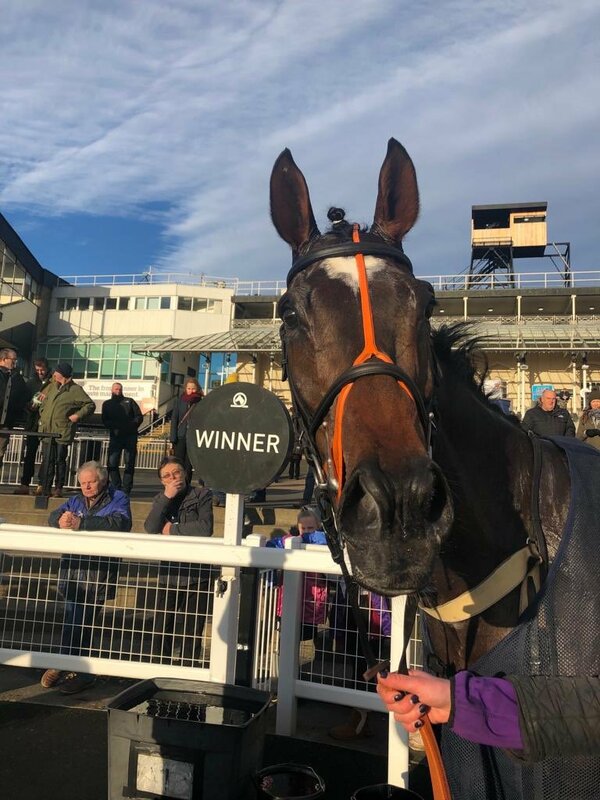 Promising four year old Bolton Boy made it third time lucky yesterday, coming home strongly under a fine ride from Alan Johns to win the National Hunt maiden hurdle at Sedgefield. 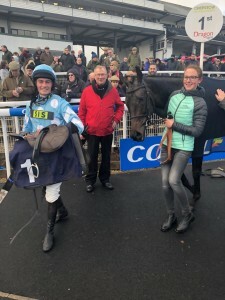 A store purchase in Ireland in 2017, he had shown promise both on his bumper debut in October and on his hurdling bow at Chepstow just three weeks ago, finishing in midfield in what looked a strong novice contest. Held up in touch yesterday, he was one of the first to come off the bridle, but responded really well to pressure and, despite still having a good few lengths to make up on the eventual runner-up at the last, he finished best of all to get up in the final strides. I’m sure he’ll learn plenty from that and, a half-brother to black-type performer Marinero and useful hurdler Tellthemnuttin, he looks a very bright prospect for his owner John Bolton. 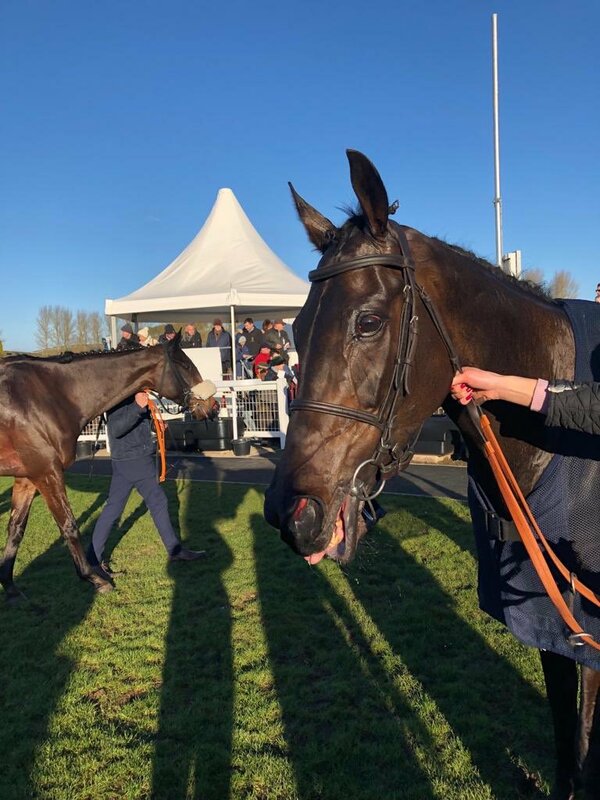 An impressive winner at Ludlow just 11 days ago, Cap St Vincent showed he is a rapidly improving chaser with a bloodless success at Musselburgh yesterday under Alan Johns. Raised 8lbs for his win on his previous start, the weight looked to make little difference to him as he travelled markedly well through the contest, jumping fluently. Angled to the outside before the third-last, Alan brought him through to challenge two out and the pair were quickly clear after the last. A half-brother to three useful performers and out of a half-sister to a Group 3 winner on the flat, he looks a useful prospect in the making and, though the handicapper will have his say once again, he should make a very bold bid for the hat-trick next time.